Rotator cuff muscles are important in shoulder movements and in maintaining shoulder joint stability. The rotator cuff, also called rotor cuff, identifies the group of muscles and tendons that act to stabilize the shoulder. The rotator cuff muscles undergo a tremendous amount of stress under normal circumstances. Add the stress and strain of tennis or baseball and the risk of suffering sports injuries increases dramatically. Pain when attempting over-the-head activities. Potential causes of irritation to the rotator cuff include sports that may overuse the shoulder and occupations requiring frequent overhead reaching. Irritation can lead to inflammation and impingement. Slow onset of discomfort and pain in the upper shoulder or upper third of the arm and/or difficulty sleeping on the shoulder. Tendinitis and bursitis also cause pain when the arm is lifted away from the body or overhead. If tendinitis involves the biceps tendon (the tendon located in front of the shoulder that helps bend the elbow and turn the forearm), pain will occur in the front or side of the shoulder and may travel down to the elbow and forearm. Pain may also occur when the arm is forcefully pushed upward overhead. All muscle injuries benefit from R.I.C.E. This modality is recommended by physicians, DOs, physical therapists, athletic trainers, and chiropractors. Rest means ceasing movement of the affected area. Icing uses ice to reduce inflammation. Elevation involves placing the area higher to reduce inflammation and swelling. For all muscle tears and strains, cold compression therapy reduces pain and swelling. Use a cold compression therapy wrap for 15 minutes before bedtime to help reduce pain that interrupts sleep. Exercising the individual rotator cuff muscles can strengthen the rotator cuff, rehabilitate shoulder injuries, and prevent future ones. Pain and restricted movement of the arm can occur when tendons at the ends of rotator cuff muscles become torn. 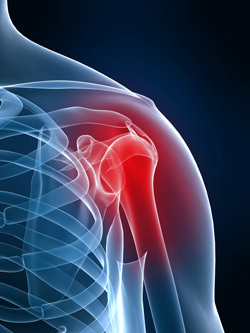 A torn rotator cuff can occur following a trauma to the shoulder or through wear and tear of the tendons. It is commonly associated with motions that require repeated overhead motions or forceful pulling motions. This problem is seen with athletes who make repetitive throws, such as baseball pitchers, American football quarterbacks, volleyball, water polo players, swimmers, boxers, kayaking, fast bowlers in cricket, and tennis players. This type of injury commonly affects music conductors, choral conductors, and orchestral conductors, due to the swinging motions used to lead their groups.